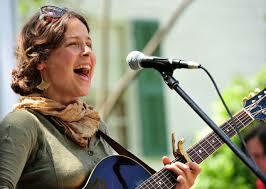 May Erlewine is a singer-songwriter from Big Rapids, Michigan – with over 15 albums of original work published since the beginning of her career, in the early 2000s. Her songs have been covered by other artists on the local and national music scenes in the United States. May has played for us before at Seven – she was one-half of the Sweet Water Warblers who accompanied Lindsay Lou in August 2017 – and definitely struck us as one to watch for the future. She made a short visit to the UK earlier this year to appear at Celtic Connections and made a lot of new friends with her show including Cerys Matthews who has plugged her ever since. She’s now back headlining her own tour – as a trio, backed by 2 stellar musicians in their own right – a welcome return to Seven for Charlie Muench who was formerly part of the great Stray Birds and a welcome to PJ George of the Flatbellys. When she starts to sing, there’s no way around it. Welcome to the moment, everyone.